7th lunar month of 1763: he started his career at the Nakamuraza, where he worked under the name of Sei Hidesuke. 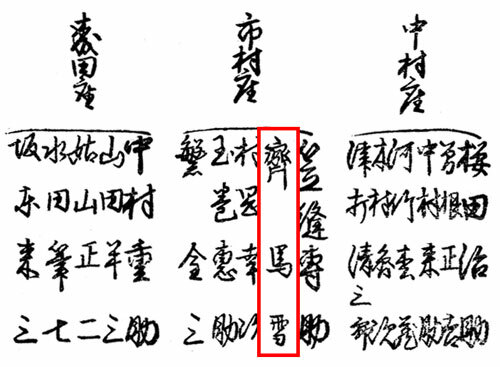 11th lunar month of 1763: Hidesuke worked at the Nakamuraza, along with Kanai Sanshô, Masuyama Kinpachi I, Nakamura Tôkitsu, Hata Bunsuke, Kanai Sanpei II and Kawai Kinji, on the kaomise drama "Daijôbu Takadachi Jikki", which celebrated the shûmei of Ichikawa Yaozô II and Ichikawa Komazô II. 11th lunar month of 1766: Hidesuke worked at the Nakamuraza, along with Kadota Sorobê, Dontsû Yosabê I, Nakamura Jûsuke II, Masuyama Kinpachi I and Kawatake Shinshichi I, on the kaomise drama "Kogane no Hana Kaijin Arasmusha", which celebrated the arrival in Edo of the Kamigata actor Kirishima Gizaemon I. 11th lunar month of 1767: Hidesuke worked at the Nakamuraza, along with Kadota Sorobê, Dontsû Yosabê I, Kawatake Shinshichi I and Tsuuchi Denjûrô II, on the kaomise drama "Taiheiki Shizu no Furisode". 11th lunar month of 1769: Hidesuke became nimaime sakusha; he worked, along with Nakamura Jûsuke II, Nakamura Seikurô II, Minonaka Saiji and Kimura Yaichi, at the Moritaza on the kaomise drama "Na ni Takashi Kumoi no Yumihari", which welcomed in Edo the actors Yamashita Kinsaku II and Kasaya Matakurô II (who also celebrated his shûmei) and celebrated the shûmei of Nakamura Shirogorô IV. 11th lunar month of 1771: he took the name of Sei Basetsu and worked at the Moritaza, along with Horikoshi Saiyô, Ogi Batai, Nakamura Seikurô II, Kishida Tôtarô II and Sei Hidezô on the kaomise drama "Fukikaete Tsuki no Yoshiwara", which welcomed in Edo the Kamigata actor Nakamura Jûzô II. 1st lunar month of 1772: Basetsu worked in the same theater on the new year sogamono "Hatsu Akebono Niwatori Soga"; the roles of Soga Gorô Tokimune, Soga Jûrô Sukenari and Kudô Saemon Suketsune were played by Nakamura Jûzô II, Ichikawa Danjûrô V and Nakamura Tomijûrô I. 11th lunar month of 1772: Basetsu worked at the Moritaza, along with Horikoshi Saiyô, Nakamura Torahachi, Masuyama Kinpachi I, Kasanui Sensuke I and Sei Hidezô, on the kaomise drama "Izu Goyomi Shibai no Ganjitsu", which celebrated the shûmei of Sawamura Chôjûrô IV, Sawamura Kijûrô II and Mikuni Fujigorô. 11th lunar month of 1773: Basetsu worked at the Ichimuraza, along with Nakamura Jûsuke II, Nakamura Seikurô II and Sei Hidezô, on the kaomise drama "Kaeri Kiso Kigoto no Hatsumono", which celebrated the shûmei of Ichikawa Danzô IV. 11th lunar month of 1774: Basetsu worked at the Moritaza, along with Masuyama Kinpachi I, Kasanui Sensuke I and Taguchi Kinzô, on the kaomise drama "Ichi no Tomi Tsuki no Kaomise", which welcomed in Edo the Kamigata actor Nakamura Shingorô II. 11th lunar month of 1775: he took the name of Hirota Basetsu and worked at the Moritaza, along with Nakamura Jûsuke II and Masuyama Kinpachi I, on the kaomise drama "Kikujidô Shuen no Iwaya". 11th lunar month of 1776: Basetsu worked for the tatesakusha Sakurada Jisuke I at the Ichimuraza on the kaomise drama "Sugata no Hana Yuki no Kuronushi". 11th lunar month of 1777: Basetsu worked, along with Horikoshi Nisôji I (he fell ill and could not work on this drama) and Okuno Sasuke, at the Moritaza on the kaomise drama "Hito no Kuni Yori Mitsugi no Irifune", which celebrated the return to Edo of the actor Sawamura Sôjûrô III. 11th lunar month of 1779: Basetsu worked for the tatesakusha Masuyama Kinpachi I at the Nakamuraza on the kaomise drama "Kaeribana Eiyû Taiheiki", which celebrated the shûmei of Yamashita Mangiku I. 1st lunar month of 1780: Basetsu worked in the same theater on the new year sogamono "Hatsu Akebono Niwatori Soga"; the roles of Soga Gorô Tokimune, Soga Jûrô Sukenari and Kudô Saemon Suketsune were played by Ichikawa Monnosuke II, Bandô Mitsugorô I and Ichikawa Danjûrô V.
11th lunar month of 1781: he took the name of Sei Basetsu and worked worked for the tatesakusha Kasanui Sensuke I at the Ichimuraza on the kaomise drama "Mukashi Otoko Yuki no Hinagata", which celebrated the shûmei of Matsumoto Sanjûrô and Ichiyama Sukejûrô. 11th lunar month of 1782: Basetsu worked for the tatesakusha Kasanui Sensuke I at the Ichimuraza on the kaomise drama "Ise Heiji Eika Goyomi". 11th lunar month of 1783: Basetsu worked at the Moritaza on the drama "Ono no Terusaki Yuki no Akebono", which celebrated the shûmei of Sakata Hangorô III. No record afterwards. Sei Basetsu was an Edo sakusha, who was active for 20 years from 1763 to 1783. He worked for the best sakusha of the Meiwa/An'ei/Tenmei eras, like Kanai Sanshô, Sakurada Jisuke I, Horikoshi Nisôji I, Nakamura Jûsuke II, Masuyama Kinpachi I or Kasanui Sensuke I.